North coast waters averages 10 to 15 feet visibility in the spring and summer, but improves in the fall. While SCUBA-clad sightseers and spearfishers are common enough, the snorkeler dominates. Abalone has by far been the most popular target in this fishery. However Abalone season is closed for the calendar year 2018. Regulations are strictly enforced, penalties can be savage. “Know before you go!” Please refer to regulations by the California Fish and Wildlife department for details. Equipment rentals and air fills may be available 4 miles south in Gualala at JR’s Home and Auto Center (call to confirm availiability. (707) 884-3534. 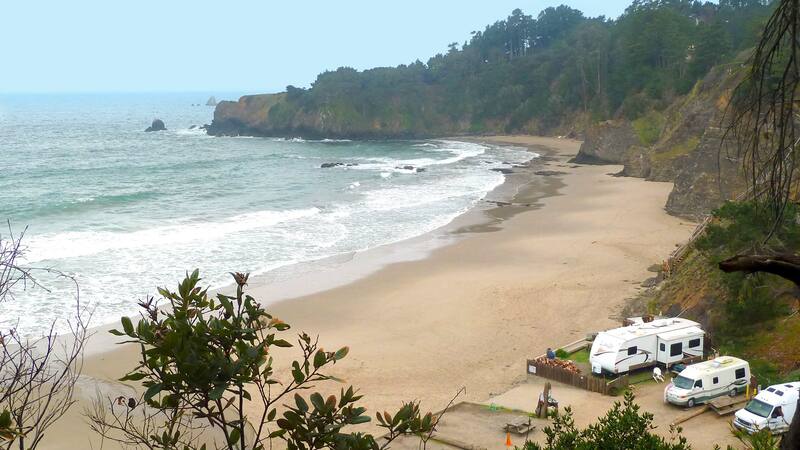 Ocean Conditions Recording from Salt Point State Park call (707) 847-3222. For the boat fisher, your aluminum boat of 12 to 14 feet, or inflatable (with an outboard in the 10 to 25 HP class), is launchable with a little know how. The launching area in Chicken Cove is a healthy stroll up the beach so it is necessary to have launch wheels attached and/or you can use the camp’s launch cart. Launching ends when the sand goes out (from about November to May). 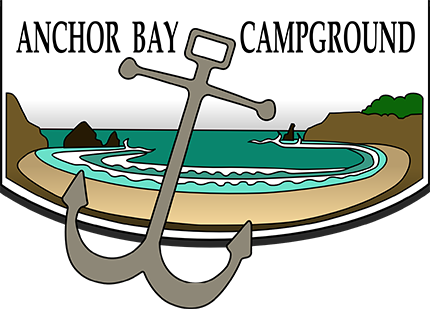 Anchor Bay staff can provide boat shuttle to the cove, subject to scheduling and beach conditions. For the shore fisher, just walk out any old time and start fishing. The ocean salmon run from June to August can be great, so much so that we hold an Annual Salmon Derby. And who would have thought that crabbing for Dungeness Crabs would be so good. There are some fresh water fishing possibilities during winter runs of steelhead on the Gualala River. Tackle and information on local conditions are available in Gualala at Gualala Sport and Tackle (707) 884-4247 and at Jay Baker True Value Hardware (707) 884-3534. Please refer to regulations by the California Fish and Wildlife department for details. This sport has boomed. More folks are discovering a more intimate connection with the hidden magic of this rugged coastline. Anchor Bay’s ocean-level access makes putting a kayak in a snap. The launching out front might present a challenge at times, but Chicken Cove, a 1/4 mile up the beach, is almost always as calm as a lake. Then there are several miles, both to the north and south, with little or no other such access. A 3/4-mile paddle out to Fish Rocks Island begins a world class experience. Kayak rentals are available at Adventure Rents in Gualala. For an experienced kayaker’s point of view, with both pictures and text, visit Mike’s Kayak Journal. Tide pooling, sand castle building, sun bathing, surfing, boogie boarding, skim boarding, jogging, or doing nothing at all. For the kids, the water is cold but safe with proper supervision. A lightweight surf suit can give them more time in. At times a small lagoon/pond forms where our creek meets the beach. This is a favorite spot for the younger kids. There is no lifeguard on duty. The annual California Grey Whale migration between Baja California and the Bering and Chukchi Seas brings all 20,000+ right past. The first southbound whales are usually spotted here late November, and sightings continue throughout the winter. However, they tend to stay farther offshore during this leg and are more difficult to spot. During the northbound leg, beginning early spring, they tend to hug the coast more closely. Late in the migration, the cows with their new calves will often come right inside the bay. Best sightings are late March to early May.